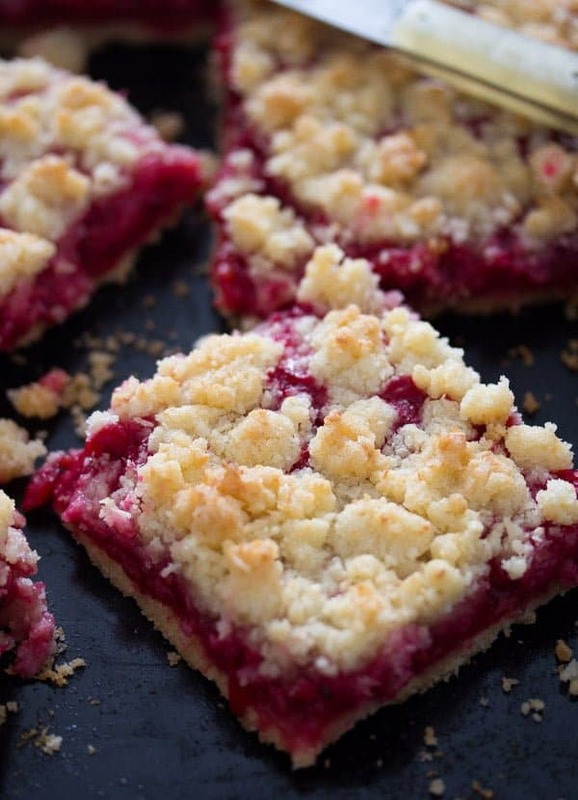 A typical German streusel cake loaded with fresh red currants and topped with a delicious and easy to make coconut streusel. I do love German bakery. The Germans are world champions when it comes to baking bread and they have, at least for me, the best cakes you could possibly imagine. And so many cakes! Cream cakes, fruit cakes, berry cakes, cheesecakes, pies and so on. 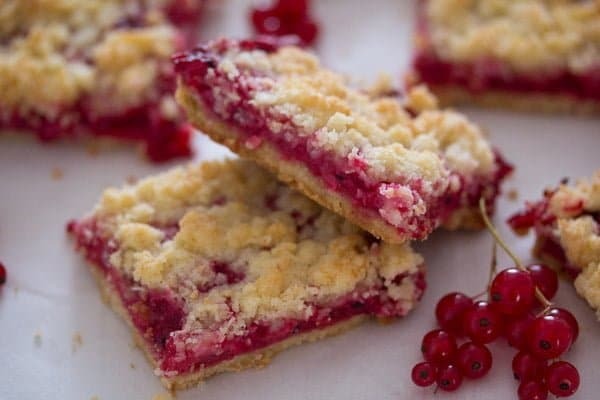 And some of the most popular cakes, especially in summer or autumn, when fruit and berries are plentiful, are the streusel cakes. 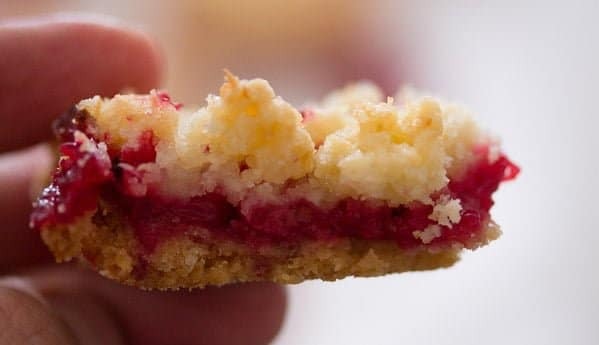 I have made so many different streusel cakes over the years, I cannot even remember them all, but what I do know is that each one of them was delicious. Streusel cakes are the kind of cakes you tend to bring to a potluck in summer. They contain no whipped cream or other milk products that can spoil in the heat, they are super easy and quick to make (even when made with a yeast dough) and most of the times they are baked on a large baking tray meaning that you can make a rather large cake to serve many people. And streusel cakes are also very cheap to make. Some flour, butter and sugar and lots of cheap seasonal fruit or berries, which you normally get without having to pay for it around here, this time of year. 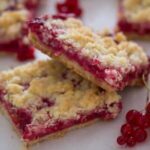 It was the same with this red currant streusel cake, I only baked it because I had tones of red currants. The sister of a friend of mine called me about two weeks ago and asked if I would like to have some red currants. So, I picked and picked, a whole bucket and there were still so many red currants left for the birds. Then I’ve made lots of red currant jelly and jam, more than I ever made, it will probably last me for 2 or 3 years as I use it mainly to make cookies or Linzer jam pies around Christmas or some fancy sauces for duck or game. And I have made cakes. This streusel red currant cake and another typical German red currant cake with meringue on top, a red currant cake I make every year I happen to have so many red currants, I wonder how come I have never posted that one yet. 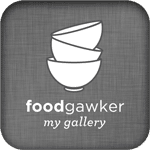 And if you are in search of other ideas for using your fresh red currants, have a look at these posts for Tiger Prawns with Red Currant Sauce and Rocket or this Easy Red Currant Cobbler with Almonds. The red currants are rather sour, definitely less sweet than many other more popular berries, but so good and packed with vitamins and good stuff, you should definitely plant a bush if you happen to have a garden and live in a climate where the red currants are able to grow. What a wonderful feeling it is to go through your garden and eat a few red currants directly from the bush! One cup of red currants contains 77 % of the daily needed amount of vitamin C. It is the vitamin C that gives red currants their sour taste. But the vitamin C helps fight infections in your body and help you recover from illnesses and it also helps fight free radicals in your body. Vitamin C is also good for your skin and hair as it helps create collagen, a protein found in hair and skin. Eating red currants helps strengthen our immune system, prevents colds and other respiratory diseases. The red currants have a low glycemic index, preventing sugar cravings, for instance. Red currants also contain the vitamin B, especially vitamin B5, which helps fight stress, lower cholesterol levels, improve rheumatic diseases and helps when suffering of migraines. They also contain vitamin K, which helps retain calcium in the bones, thus making your bones stronger and they are also rich in minerals like calcium, magnesium, potassium and iron. The red currants need some time to release some of their juices. Before you start with the dough, give the currants to a bowl, sprinkle with a little sugar and let stand until ready to use. Drain the berries but keep their juices. You will need that when making the berry topping for the streusel cake. I use some cassis as well, when making the berry topping. You can find a recipe for homemade cassis here. If you don’t want to use cassis or don’t want to buy it just for one cake, you can leave it out and replace it with water. You will need a total amount of 160 ml/ 5.4 fl.oz/ 2/3 cup liquid to thicken the berry mixture. This mixture consists of the juices that the red currants will release, cassis and water. The proportions don’t matter so much. Give the released juices to a measuring jug, top with cassis if using and fill with water to 160 ml/ 5.4 fl.oz/ 2/3 cup liquid. 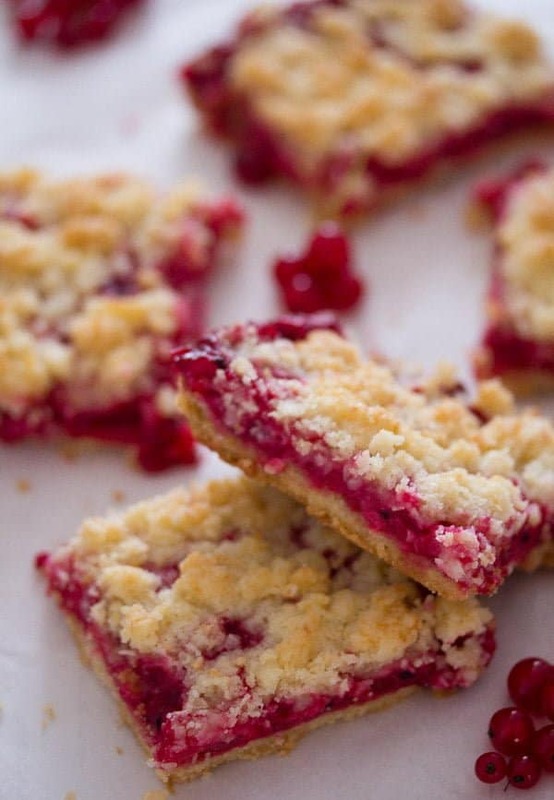 Many German streusel cakes are made with a yeast dough, covered with berries or fruit pieces and topped with streusel. However, in this case, you will not have to bother with making a yeast dough. A yeast dough is not particularly difficult to make either, but requires a little bit more effort than this. 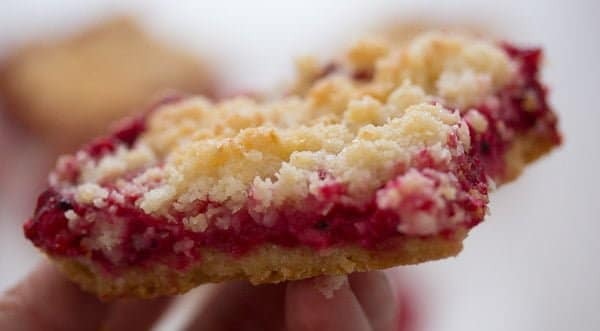 And the dough we use today for this Easy Streusel Cake with Red Currants and Coconut it only takes minutes to mix. Not to mention there is no rolling of the dough involved, which is always a plus point, if you ask me. 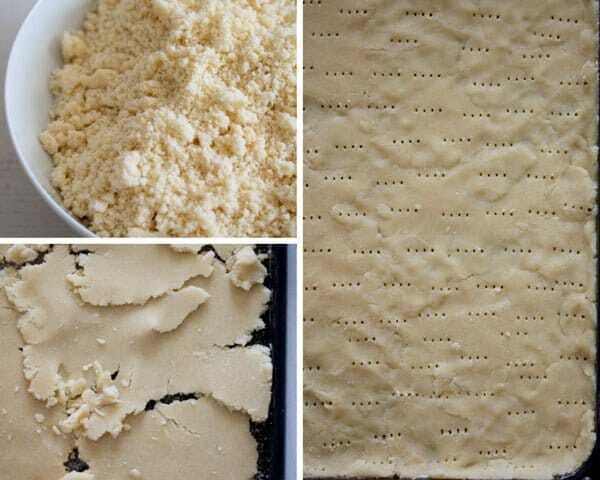 For the shortcrust dough, give all the required ingredients to the food processor and pulse shortly until the mixture resembles breadcrumbs. Give the mixture to the working surface and knead very shortly to get a smooth ball of dough. Wrap this ball in cling film/plastic foil and refrigerate for 1 hour. Getting the dough onto the baking sheet couldn’t be easier. Place some lumps of dough on the tray and press them together in an even layer to cover the tray. Lightly flour your fingers, if necessary. The coconut streusel is what makes this Easy Streusel Cake with Red Currants and Coconut special. I have made loads of streusel cakes over the years, but I don’t remember ever using coconut. And it works so well, absolutely delicious, you should definitely give it a try. To make the streusel, give all the ingredients to the food processor and pulse shortly until the streusel form. 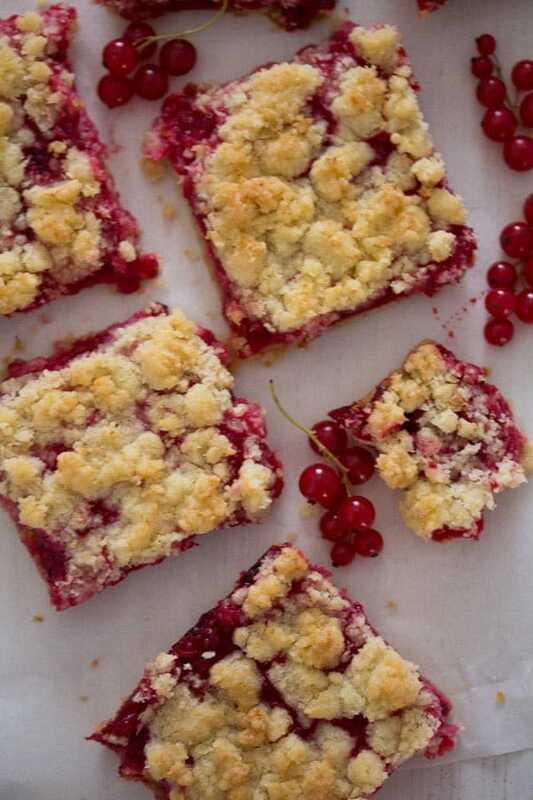 Top the red currant cake with the streusel and bake. Leave the cake cool on the baking tray, cut into squares and enjoy as it is or with some whipped cream on top. The cake keeps well for several days, when packed in an airtight container. Give the red currants to a bowl. Sprinkle with the sugar, mix carefully and let stand until ready to use. They will release some juices during this time. Give the flour and sugar to a food processor. Pulse to combine. Cut the cold butter into small pieces and give them to the food processor together with the egg. Process shortly until the mixture resembles breadcrumbs. Give the dough to the working surface and knead very briefly to form a smooth ball. Wrap in cling film/plastic wrap and refrigerate for one hour. Preheat the oven to 180 degrees Celsius/ 360 degrees Fahrenheit. Grease a large baking tray of about 30x40 cm/ 12x15 inches. Sprinkle it evenly with the dried breadcrumbs. Place some lumps of dough on the tray and press them together in an even layer to cover the tray. Lightly flour your fingers, if necessary. Prick the pastry all over with a fork. Bake the pastry for about 20 to 25 minutes until golden brown. In the meantime prepare the red currants and the streusel. Drain the currants well and catch their released juices. Give the juice to a measuring jug. Add the cassis (if using) and water to have a total amount of 160 ml/ 5.4 fl.oz/ 2/3 cup liquid in the measuring jug. Give the liquid to a saucepan, reserving about 4 tablespoons of it to mix with the cornstarch. Bring the liquid in the saucepan to a boil. In the meantime, give the cornstarch to a small bowl and add the reserved 4 tablespoons liquid. Whisk well to obtain a smooth pourable paste. When the liquid comes to a boil, slowly add the cornstarch mixture while whisking continuously. Add the red currants and stir carefully. Let it bubble once or twice and remove from the heat. Give the dessicated coconut, flour and sugar to the food processor. Pulse shortly to combine. Cut the cold butter into small pieces and give them to the food processor. Process to obtain streusel. 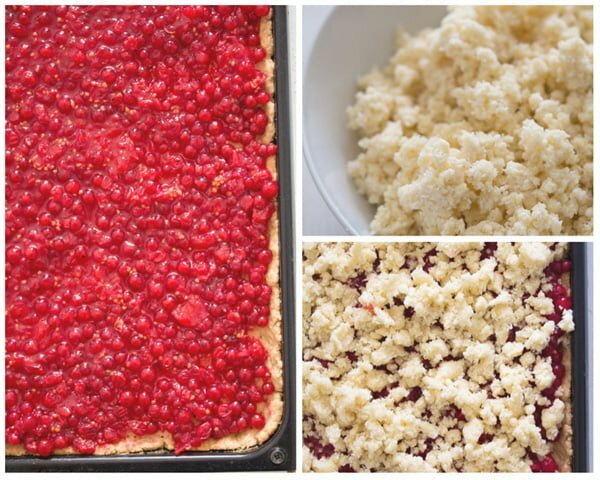 When the shortcrust pastry is golden, take it out of the oven and spread the red currant mixture evenly on top. 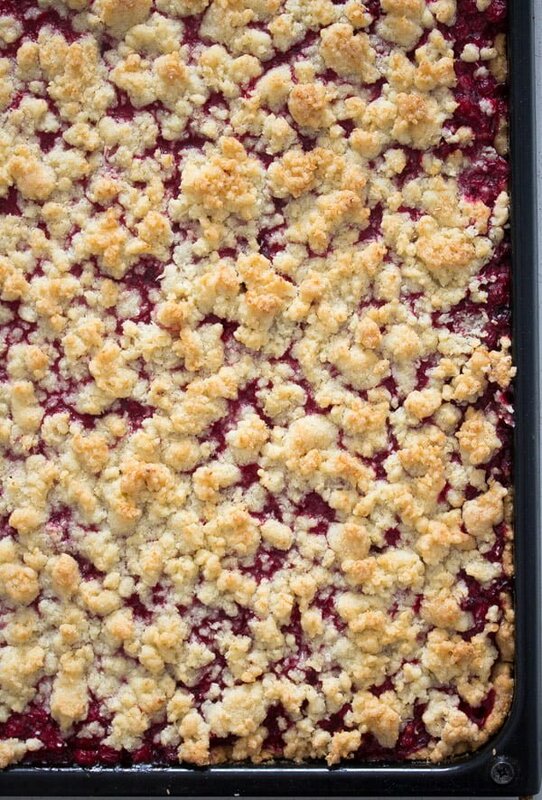 Sprinkle evenly with the streusel and continue baking at the same temperature for about 30 minutes or until the streusel is golden brown and the red currant mixture underneath is bubbling. 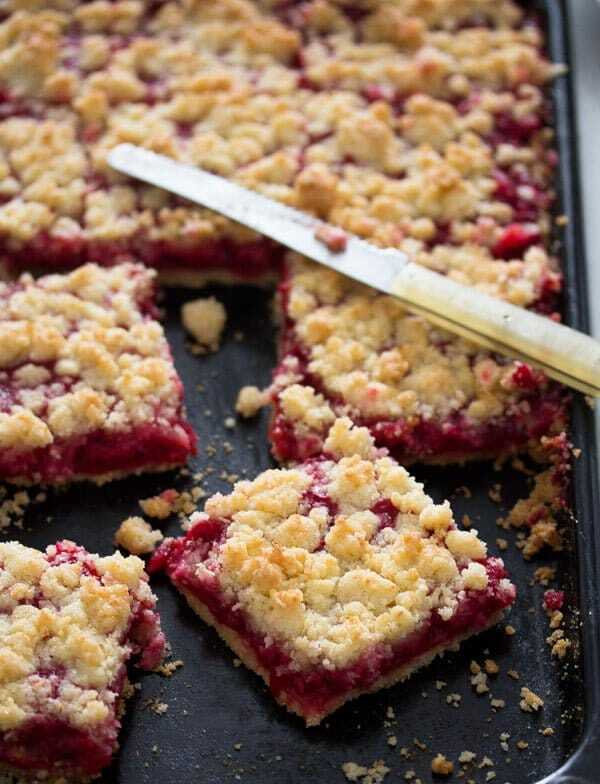 Let the red currant streusel cake cool on the tray, cut into squares and serve. You can serve the cake as it is or with a dollop of whipped cream on top. If you don't have or don't want to use cassis for the cake, you can replace it with the same amount of water. I love this cake! One of my neighbors has red currents so I would love to make this. The crumble topping is my favorite. i haven’t eaten many currants in my life, but i still know i’d love this beautiful cake!